Carte de Visite (CDV) measuring 2.5 x 4 inches. Photographer is J. P. Vail of Palmyra, New York. Otherwise undated and unidentified. 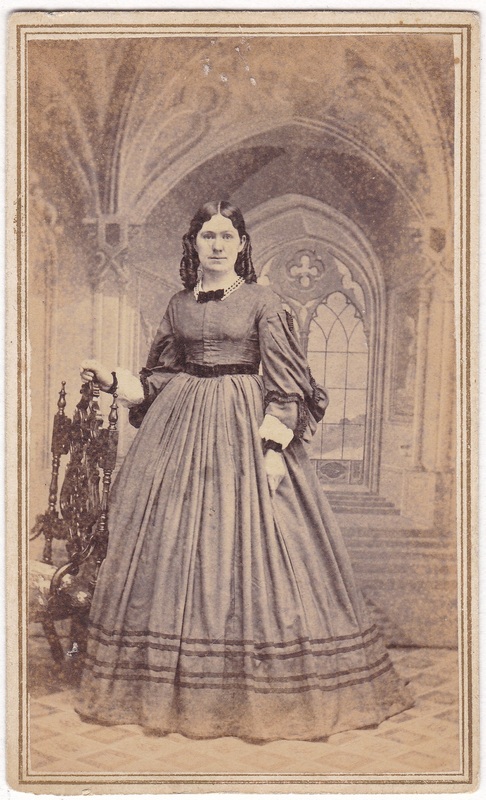 This is the second CDV I’ve posted of a standing woman photographed by J. P. Vail in Palmyra. The other one is here. I have no idea if these women have any connection to each other beyond the coincidence of the same photographer, but it’s fun to speculate. It’s also fun to compare and contrast the photos, given that they are the work of the same artist. These came from a set of CDVs that included Civil War era images, and I would estimate that this comes from roughly the same era. The dress feels like it’s from that era, though the fancy backdrop feels a bit later, but I get so easily confused about such things. As always, feedback on the date (or on anything) is welcome. The background is very cool. Not something you generally see.